Maybe it’s just me, I suppose, but does anyone else notice something really odd about the bananas this year? In previous years, I could buy a bunch that was a bit green and wait two days for them to be all yellow, and ready to eat. This year, however, the green ones stay green longer at home and when I do crack one open it is all soft and mushy… which in previous years would have been signified with a spotty or brown peeling. So it is like the thing is unripened on the outside but over-ripe in the middle. And then there are some that seem to be a bit grayish in their greenness and the surface seems to feel a bit waxy. These suckers do not change color one iota but are still over-ripe on opening. Bruises to the banana used to show up on the peeling as well. A dark spot or brown patch would hint of something damaged inside. Not so this year! 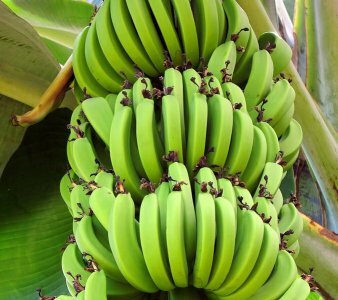 The banana looks clean and perfect outside but inside has large mushy brown spots caused from either bruising or dropping from the top of the banana tree. Or rolling over it with a fork lift. Normally, I go ape over bananas but this year it seems to have less appeal that before. Unless, of course, you are making banana bread, whipped bananas, stewed bananas or fermented banana mash. Maybe I’ll check out the organic bananas and see it they have the same problem. Somehow, I don’t think they will.